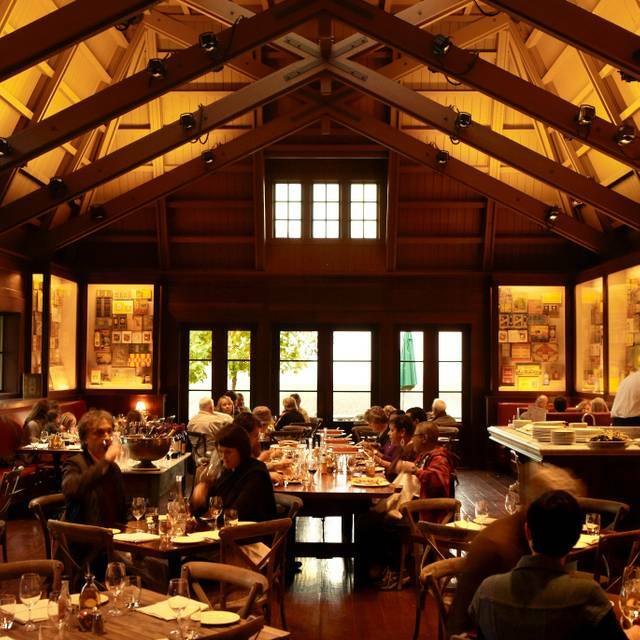 RUSTIC offers service in our casual dining room and on an outdoor terrace overlooking the vineyards of Alexander Valley. A bar adjacent to the restaurant also serves a full complement of cocktails and an extensive wine and beer list. We had reservations on a Sunday for 2:15 but arrived an hour early. They seated us within 15 minutes at a table outside overlooking the gardens - beautiful day and quiet enough for two diners in a sea of larger parties. Our waitress was professional, knew the menu and wines and answered all of our questions helpfully and cheerfully. We ordered the Rack of Lamb Madame Bali , medium rare, and a side of escarole, followed by dessert and coffee. We started with a couple of the complimentary zeppole and ordered an additional bagful - like fried and salted dough. Every plate was outstanding - lamb was cooked perfectly, moist, yet crusty on the outside, with grilled asparagus, carrots, onions over white rice (only downside, would have preferred creamy polenta or couscous.) Lamb was full of flavor, just perfect. Escarole was grilled with garlic and olive oil to a crunchy tenderness - again, perfect. Dessert was a sampler with chocolate mousse (rich and dark), panna cotta (silky and lush but would have preferred without rasberry coulis) and pistachio cream puffs ( light, tender and delicious) and a cup of rich espresso. Wine was a jammy Coppola Pinot. Ambience, service and food quality top-notch. We were never rushed or "over-served" - service was well-paced. Well-worth a trip up to Rustic for a relaxing alfresco lunch. Atmosphere and food were amazing for Graduation celebration. Service very attentive and did not feel rushed. A few exotic dishes which we enjoyed. Unfortunately they were out of the potato dish. Will definitely return again on a trip to Sonoma County! It is a beautiful setting. And that’s about it. Glad we went. Will not go back. 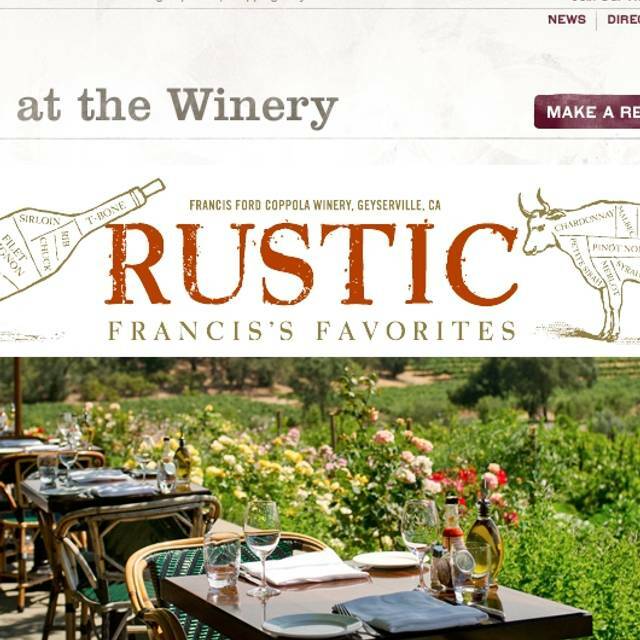 After a day at Sebastapol winery and Healdsburg tasting rooms, we went to Rustic for dinner. We talked with staff in the herb and vegetable garden outside the building. Very friendly. Beautiful grounds with flowers, hummingbirds and plenty of seating. Dinner was excellent. Enjoyed ourselves and want to return. Rustic was a favorite of ours, and we set up this group lunch (Easter) because we like(d) the place. However this time we were very disappointed and embarrassed in front of our friends. The place was so loud we couldn't talk. When the food came only one out of the 7 entrees was good. My ribs weren't heated through. The pastas and the other dishes were not good. Only my wife's rack of lamb was good. Very disappointing. Great food and service. Love the place. We had an Easter lunch and hoped to sit outside but the weather was not cooperating. But sitting inside was great - just a bit noisy. Loved the food!! And of course the wine wasn't bad either. If you haven't been there, just do it. You'll love it. Great place to bring the family! One of my favorite places for dinner. Marrakesh lamb and a glass of Archimedes is my recommendation. Always a great place for guests. As a club member, know we will be treated well. Inside the Francis Ford Coppola vinery, very nice environment, excelent food joined by special vines. Service good, could be a little better. We LOVE Rustic, but usually visit later in the week. Tuesdays they do a family-style dinner... step right into the family's "home" with actors and servers playing the parts of an Italian a family that you're joining for dinner, with live accordion music and incredible Italian singing. There's no ordering, they just bring dish after dish out and you eat what you like! There's no shortage of choices... I think we had about 15 different courses! Something for everyone, and every single course is delicious! It's such a fun experience, I highly recommend it! Food is fantastic, atmosphere is fun, staff is incredible - be sure to save room for desserts! This is the second time I've been to the restaurant while visiting the winery. 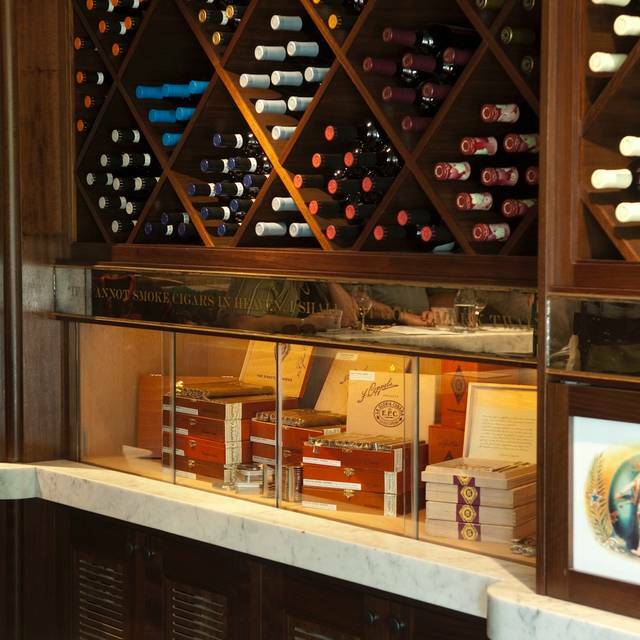 Food, service, ambiance are all fantastic! A perfect addition to and break from wine tasting. Several delicious selections to choose from. There was also a 4 course tasting menu paired with wines that people in my group tried. They loved every course and said it was a bargain for the price. My favorite spot to dine. View, servers and food all simply the best! The restaurant is fun because of the movie props. The service is wonderful. The food on the other hand is exceptionally bland. We go whenever we have out of state visitors because the setting is unique, but the food always disappoints. This was our second visit to Rustic. The food was fantastic. We enjoyed the food and wine pairing, great wines also. I am not usually a lamb fan but the rack of lamb was incredible, a must have. The service was exceptional and we will be going back again. There is a lot to like: Great food , really Great service (Vanessa) didn't rush our service though we didn't know what we wanted from the extensive menu. She offered suggestions and was able to describe preparation of the entrées. Our experience was very satisfying, though the restaurant was quite noisy. Italian comfort food at its best! But also great specialty items. Great atmosphere and view. Will, our server, always provides top-notch service. Favorite spot to take out of town guests while they visit the wine country. Also a favorite to bring friends and family for special occasions. We always enjoy our time at Rustic, especially durning spring-fall. Outdoor seating is wonderful. The food is very good and the service is outstanding. 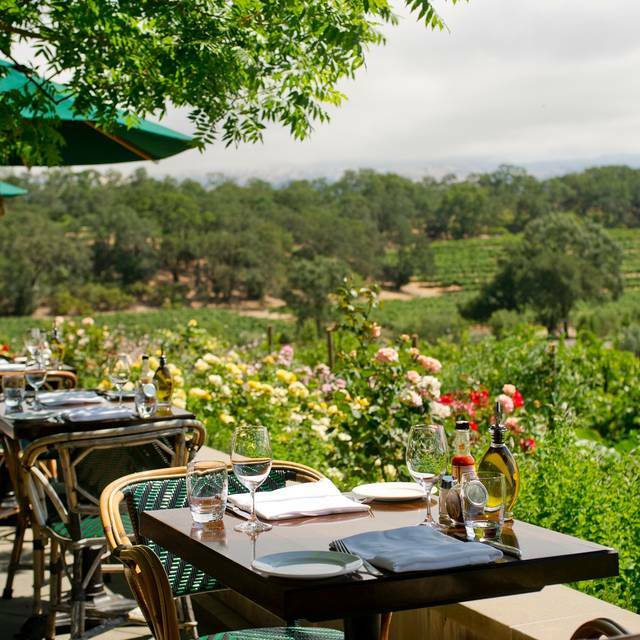 What a delightful setting on the patio overlooking the vineyards! You certainly want to get to dinner early enough (or late enough in the summer) to enjoy the sunset. We had a really nice dinner, although it was a bit cool outside, but there were patio heaters that helped. My grilled salmon was EXCELLENT, so crispy on the outside and nicely seasoned. My husband was not too sure about his spaghetti carbonara at first, but the more he ate and the more mixed the flavors of the sauce became, the more he RAVED about it. It was one of our most reasonable meals of our week in Sonoma and Napa Counties -- only $59.50, plus tax and tip, for 2 glasses of wine and 2 entrees. Awesome restaurant! It was a wonderful atmosphere with great food. I would highly recommend this to anyone. Rustic is a great spot. My wife and I go there whenever we want a special treat. The patio has a wonderful view of the vineyard and of the entire valley. The food is great and the service has always been excellent. 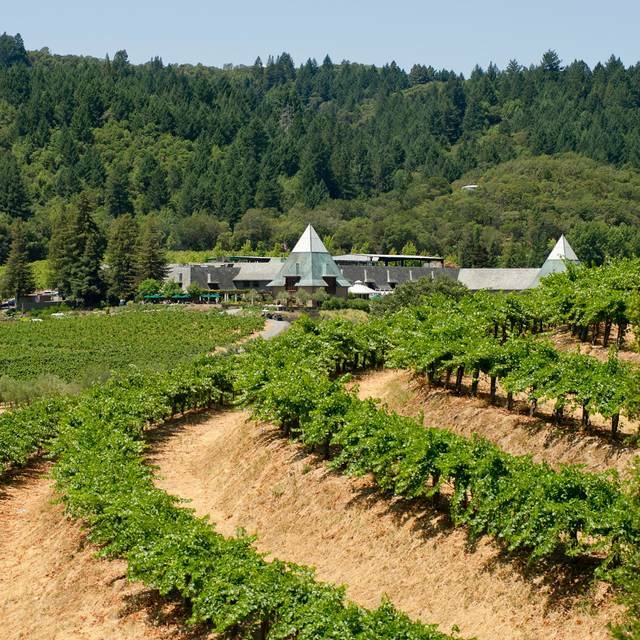 The big bonus is that it is located in the Francis Ford Coppola winery which is a destination in itself. There is an extensive display of props from his movies (Apocalypse Now, Turner, The Godfather), a tasting room and a huge public swimming pool with an outdoor bar and a bandstand...live music during summer weekends. A really fun place to spend some time. The HIGHLIGHT of our wine tour weekend!! "5 Star" across the board; the grounds, the atmosphere, the staff, the wine, the food AND THE VIEWS!!! OMG! Take a bottle of wine and sit out on the patio, and let your cares go. 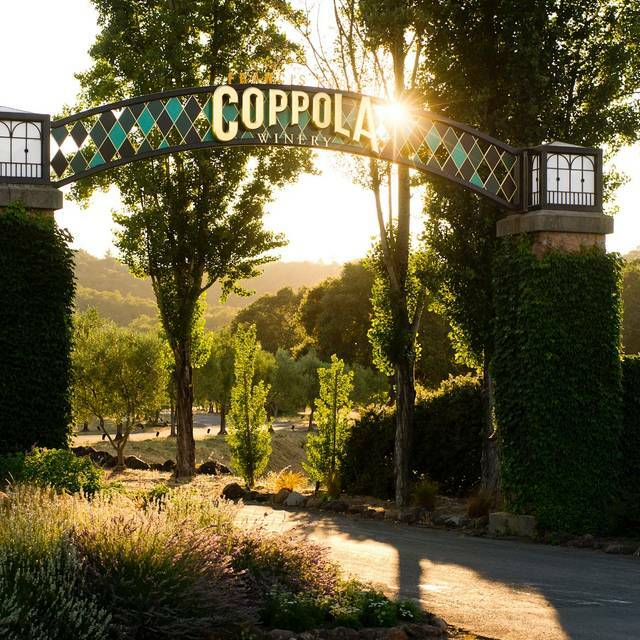 I will be incorporating a regular trip to Coppola going forward! Great food and service. I have tried their NY strip steak and their whole fish on salt. Both are very good and worth ordering. Add to that the great service that we always get from our server Jorge. 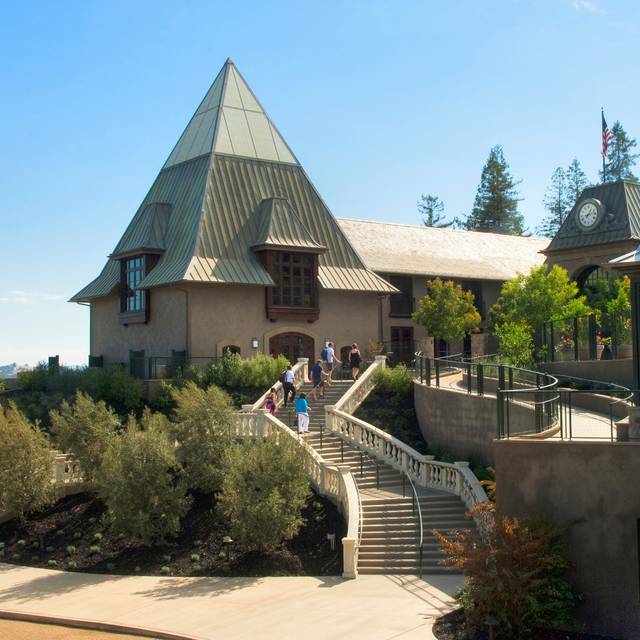 We plan on dining here every time we visit the Coppola winery. Everything; the location, the view, the service, the food, and the wine was divine. It helped that I had a cool date but FFCW really gave us a place to enjoy it in every way. It was great, it was Friday night so it was super busy, is loud be ready! A friend and I enjoyed lunch celebrating Restaurant Week and also Coppola's 10 year anniversary. We did a prix fixe menu with wine pairings. 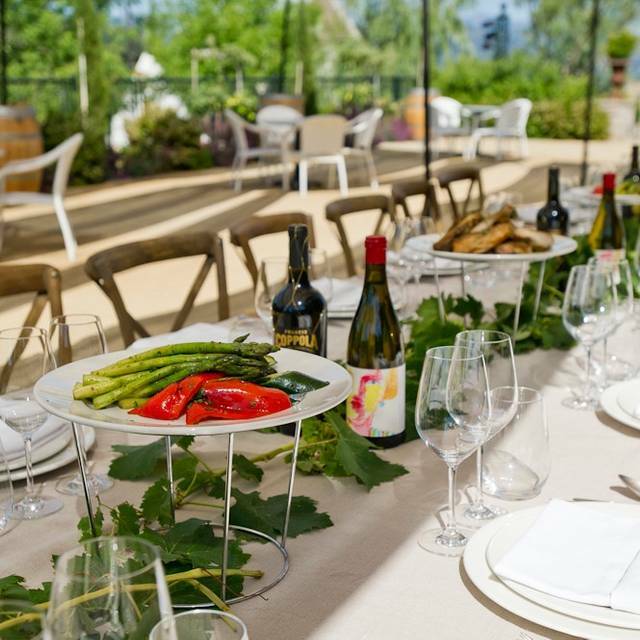 Each course was delicious and it was a lovely day to eat outside and relish the spring color in the vineyards and surrounding hillsides. Lovely! We loved our second time at Rustic. Only problem was a drunk and LOUD woman sitting next to us. Not Rustic's problem. Food is fantastic and the ambiance was perfect. One of our favorite places to dine. Always tasty, service always great! Melissa was our waitress again, very nice. Looking forward to our next visit ! Expensive Lunch during restaurant week. The menu was $39 for lunch. Typical prices during this week are $19. Dinner is capped at other restaurants at $39. The service was very good. The food was fine but not worth the price. 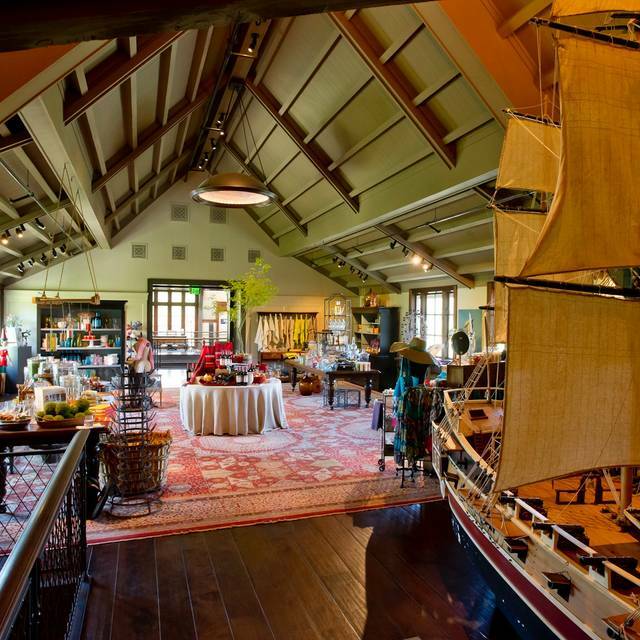 This restaurant is part of the Coppola Winery. Simply a tourist trap. I really wanted to visit the winery mostly for the 'museum', so I had no grand expectations of how anything else would be. We totally enjoyed our entire experience. It's so much more then just a restaurant, or just a winery, it was a beautiful property, a feast for the eyes. The building even though large, felt cosy and inviting, with different bars for drinking or wine tasting, and then lovely views from the restaurant, the pizza oven in the middle of the back wall (seriously perfect pizza, dough was not too thick, not too thin, just right and perfectly crispy, we had the four cheeses, big thumbs up!) our waiter Francis was friendly and professional :), our pasta's were also perfect al dente, both desserts also tasty and just the right balance of flavors. As we were having a late lunch and driving from SF, we didn't drink a lot, but we totally enjoyed the red wines we did taste, and did buy a couple of bottles, even though this was not our main intention, but it was hard not to! The various photo's and props and pieces from various Coppola movies were thrilling to see, we are big fans of the Godfather movies, but wow, when it's all put in front of you, what an impressive career, and a talented family, thank you ever so much for sharing pieces of movie history with us. It was raining for our visit, but the pool was still alluring, it would be heaven on a warm day. I hope you enjoy it just as much as us when you visit, oh yes, make sure you book the restaurant, there is a very long wait if you don't! Birthday lunch and wine tasting! Average food, decent service, tables with large groups. The wait for wine and food was toooo long, not enough help! Delicious food & drinks. Our server, Kareem always gives us VIP treatment. Simply put...a very nice dining experience. It wasn't bad, but it wasn't all that special. Wine was excellent! Service was a little snobby and not that attentive until the bill came. Pizza tasted like Pizza Hut. Worth the visit for the wine and the memorabilia.